Discussion in 'Front Page News' started by Tristan, Oct 13, 2018. 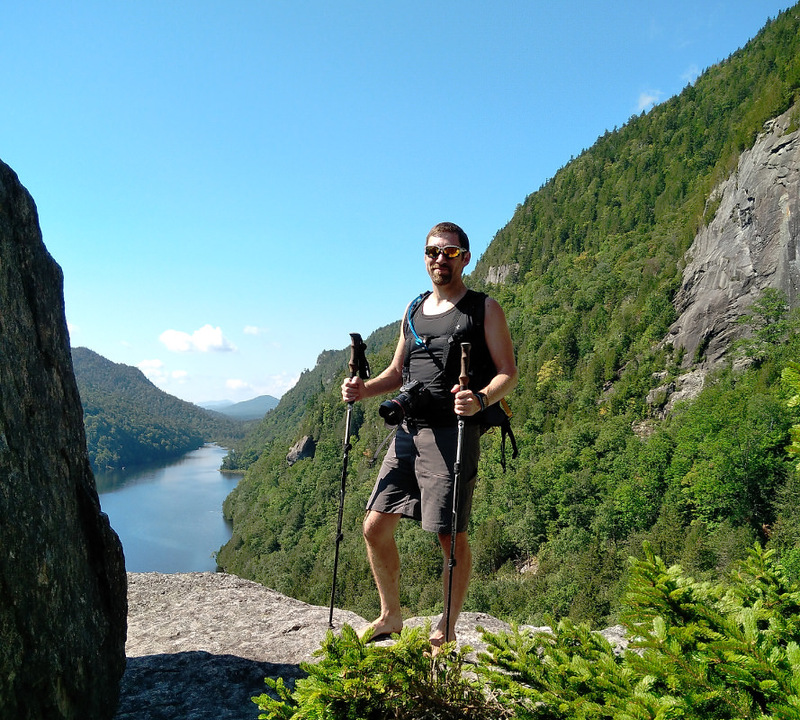 I recently posted about my long 5-day hike in the Adirondacks, but that was not the only hike there I did this summer. I was on vacation and visited the area again in September with my parents on a short camping trip, and couldn't wait to get back to the mountains! Mom and I decided to go for a day-hike one of the days we were there. 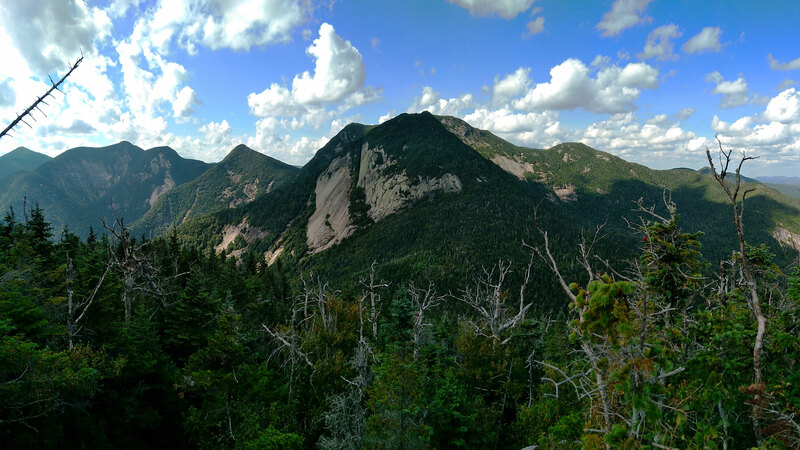 We settled on a hike of Sawteeth Mountain, a good long dayhike and rumored to be very scenic with many outlooks along the trail. It did not disappoint! The forecast for the day was one of the hottest days this summer. The nearby village of Keene Valley had a forecasted high of 93F with a heat index of 98. I didn't even know it ever got that hot in the mountains! But we were pretty stuck with the day we had chosen. 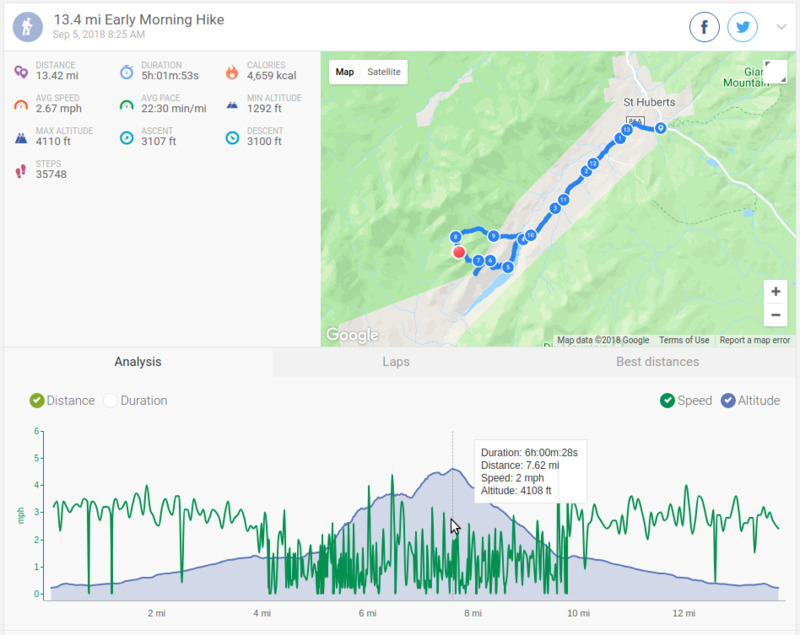 And the hike we chose was not necessarily a modest one, though it was just one mountain it was still a long trip with descent amount of elevation gain... 13+ miles with over 3,000' ascent. And optionally we were really hoping to add on nearby Pyramid Peak for just about a mile more but an extra 1,000' ascent. Mom and I departed the campground early and arrived at a mostly empty trailhead parking, a rare sight during summer! 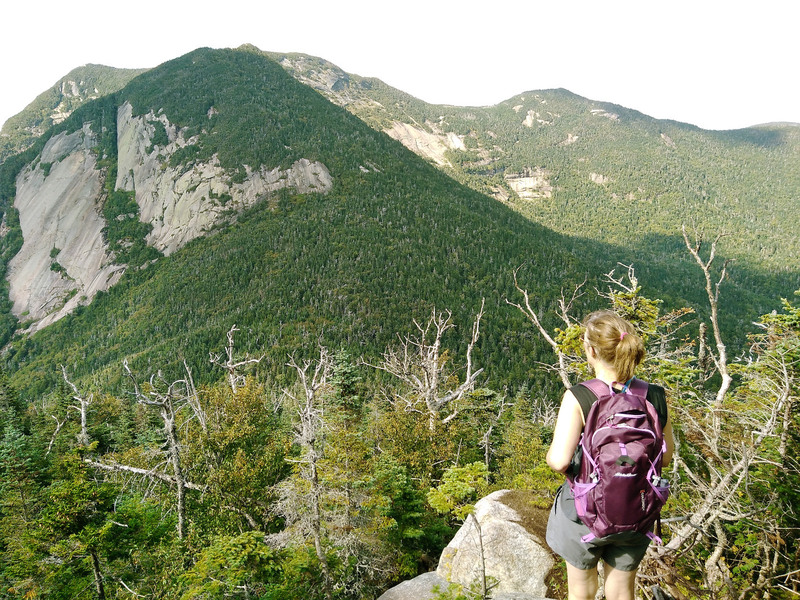 This hike starts out on private property, the Ausable Golf Club and Adirondack Mountain Reserve, which allow hikers to access a variety of trails through their lands. We signed in the trail register at about 8:30 am and were off. No one else had signed in for hiking Sawteeth, so we were hoping to have a nice peaceful hike. 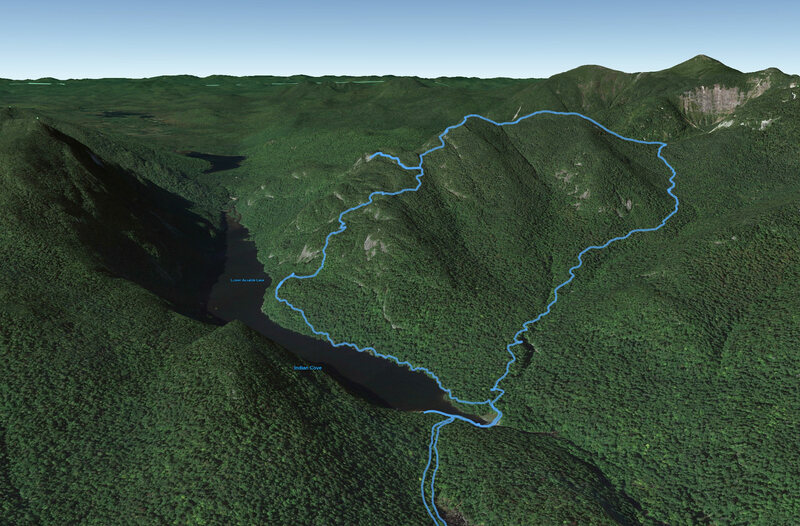 We walked a dirt road back to Lower Ausable Lake where the trailhead for Sawteeth Mountain starts. It was a beautiful morning, albeit hot. As we ascended there where many scenic veiwpoints, mainly bare rock outcroppings that allowed us nice views of the lake and mountains to the other side. 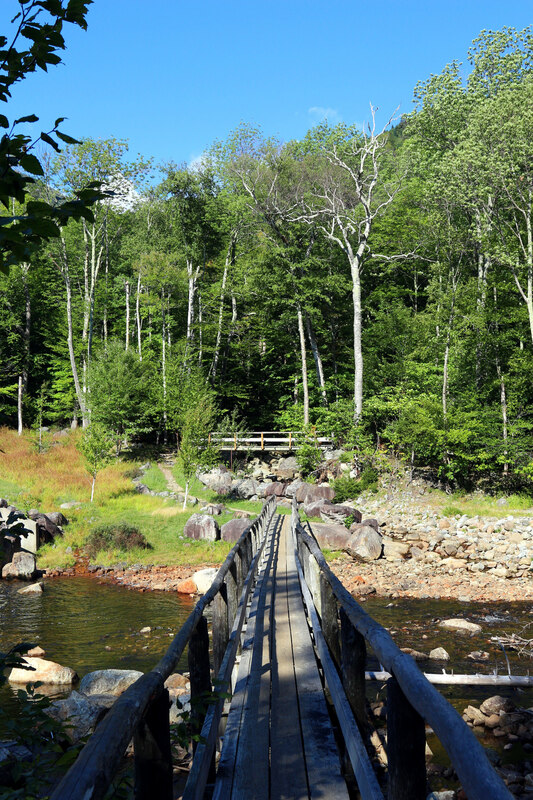 Bridge over the Ausable River. 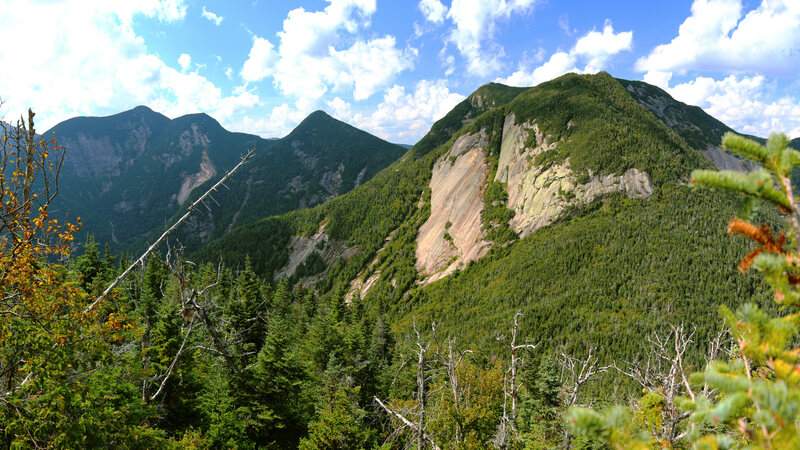 Mount Colvin on the left of Ausable Lake, and Sawteeth to the right. Yours truly on the way up Sawteeth Mountain. 13 images stitched to make this panorama. There were many outlooks on the way up, and each one got better and better. Unfortunately it was hard to photograph as the morning sun was low & directly at the camera. 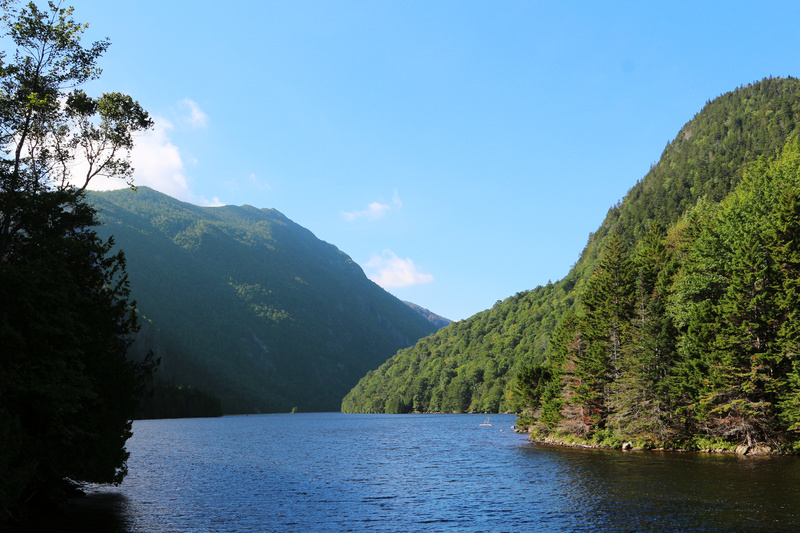 Looking towards the far end of Lower Ausable Lake with Upper Ausable Lake in the distance. 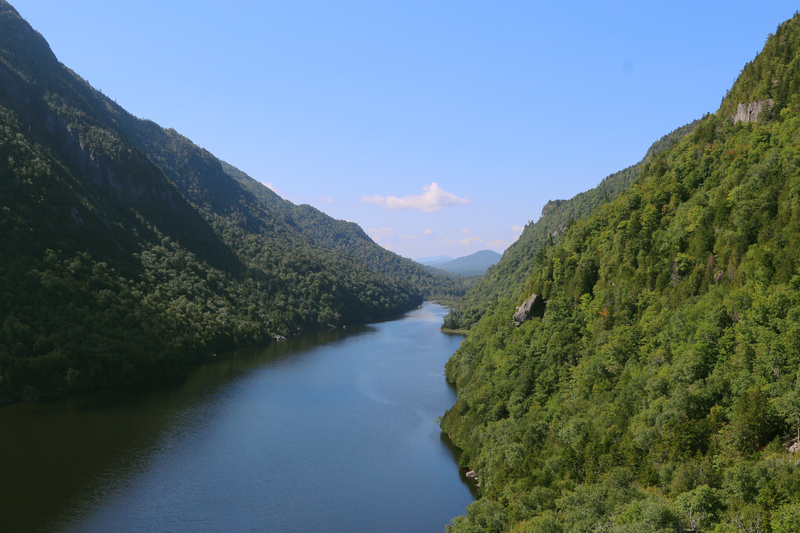 Another shot off into the distance, with Upper Ausable Lake. We didn't reach the summit until almost 2:30 pm. We had taken a few breaks already, it was indeed hot and exhausting to climb a mountain on such a day. We had the summit to ourselves for several minutes and a group of hikers showed up and we chatted while eating our lunches. I setup the camera and took some photos and soon we were off. Once again the sun made it difficult to photograph well, it had followed us into the afternoon and now on the other side of Sawteeth, hiding just barely out of frame in many of my shots. Basin Mountain as viewed from Sawteeth. 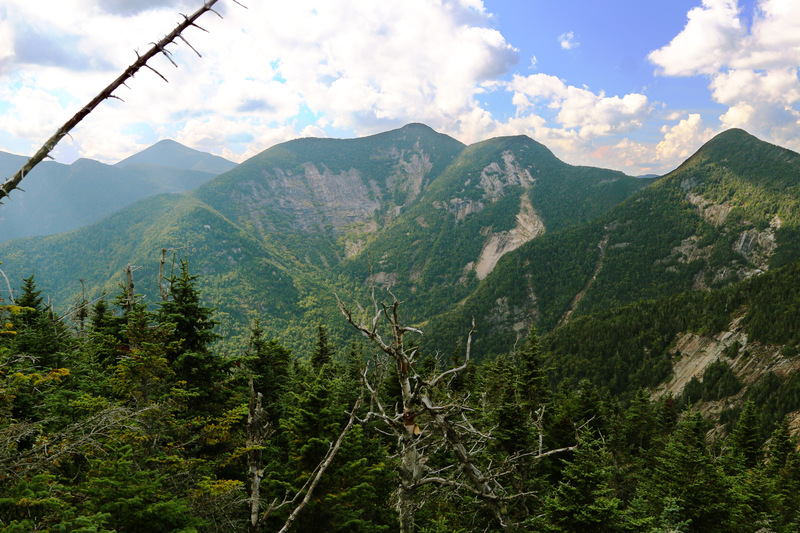 Mount Marcy in the distance. Basin Mountain on left, then Saddleback and Gothics. Panorama of much of The Great Range. Looking at Gothics & Pyramid Peak, our optional peaks of the day. It was too late to entertain the idea of adding on the extra peak we wanted, especially while staring at it from across the valley in awe. Pyramid was an unofficial peak, a shoulder of Gothics Mountain in the pic above. The shadow pretty much highlights the part known as Pyramid Peak. 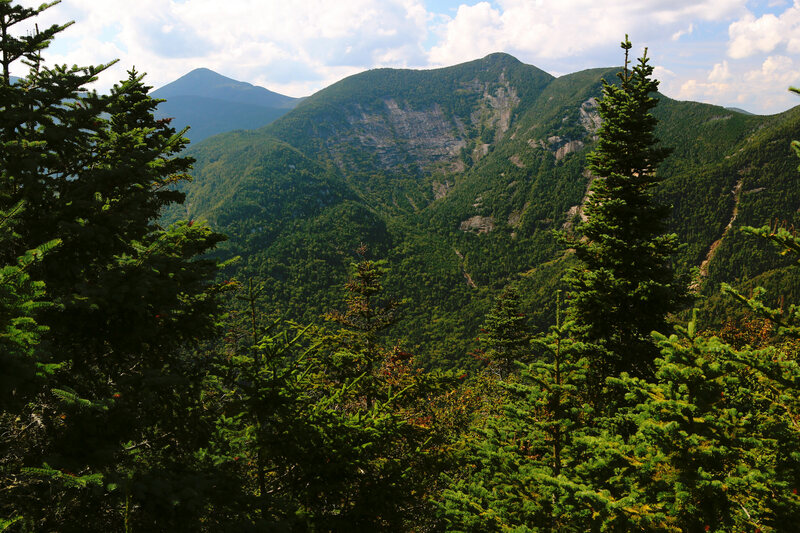 It is said to have some of the best views of The Great Range. But it will have to wait, it was too late in the afternoon and Mom was struggling already. Our GPS track rendered on Google Earth. Chris C, Robin and posnerk like this. I'm in awe. Mirrored to the home page. Thanks again. 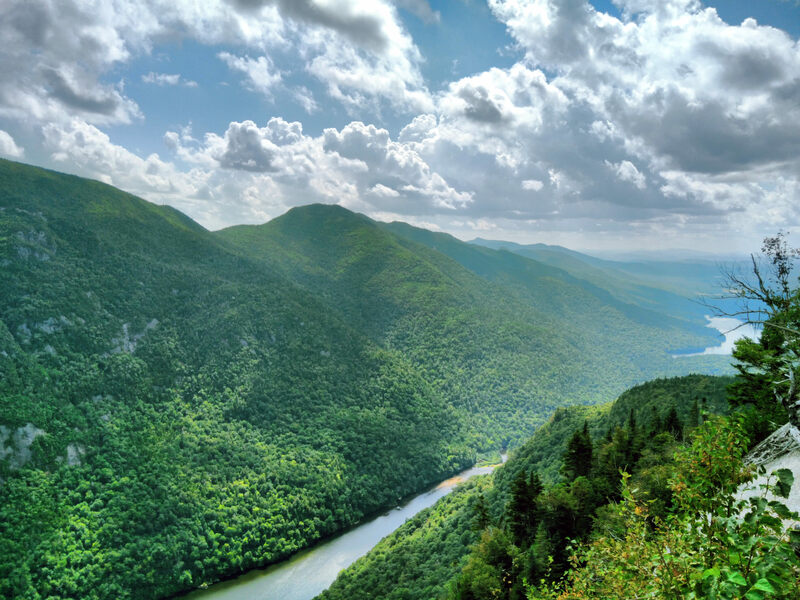 @duckfeet thanks, and I remember you chiming in on one of my other Adk hikes I posted about a few years ago. Basin looks amazing from Sawteeth with it's exposed bedrock walls. Basin and its neighbors in The Great Range were probably my favorite hike to date, I don't remember if I posted on that trip here as it was back in '13. But I can't wait to go back! I have new ones I'd like to experience first, and ones I did in my youth I don't remember well, but the Great Range will definitely be ones I revisit. It's great you took your kids there, that is how I got started... my folks took my brother and I once they figured we could handle it (I was a bit older but my bro was 6 or 7 at the time) mostly in the Whites at first (I do admit they are even nicer) but also close to 20 Adk peaks while I was in school still. I have not taken my son on a high peak, but we have done a few lesser peaks like Mt. 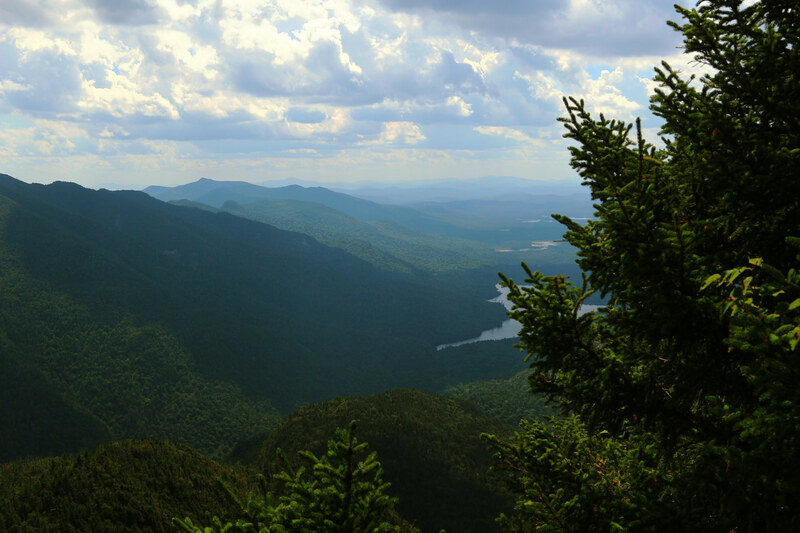 Joe (great views from such an easy hike) and the Tupper Lake Triad (Arab, Goodman, and Coney). He just doesn't take after me in outdoor adventure, nor in being fit, but trying to get him up to doing a high peak. Hope you can get back there someday, barefoot or otherwise! What a wonderful looking hike!